East Africa , Nov 5 2018 - Conflict, insecurity, political unrest and the search for economic opportunities continue to drive migration in the East and Horn of Africa. However, one of the biggest drivers of displacement is not war or the search for better jobs, but changing weather patterns. After five years of drought, more that 1.5-million people were uprooted from their homes as their soils slowly, year by year, dried and cracked. This year the skies opened up, lonely clouds joined each other, and the rains finally came. But the immediate effect was not joy as one would hope, because whenever there is drought, what follows are floods. Tract of soil hardened by years baking in the sun, turn into racing river beds. Hundreds of thousands who withstood the long dry period lost their homes to an unrelenting wet season. More than 311,000 people were displaced in the May flooding in Kenya alone. After suffering from a sustained dry period and now a definitive wet period, dare we hope for a return of internally displaced peoples to normalcy with sustained and viable livelihoods? According to the World Bank, the most recent drought, which lasted four consecutive years, cost the economy of Somalia an estimated $3.2bn. Remarkably, livestock exports fell by 75% and reached a low of 1.3-million live animals compared with a high of 5.3-million in 2015. Goats are the prime offering at any celebration in East Africa, whether it is a barbecue, breaking the fast of Ramadan, Christmas dinner, or the culmination of a wedding feast. Nyama choma is the Swahili word for barbecue and it’s the talk of any party. The success of an event corresponds with the quality of the meat. Goats are omnipresent in the city and in any village. You can see them on the side of bustling markets, dodging cars and people, grazing; their coats dirtied by the East African red cotton soil. They stand below the blooming jacarandas, filling the open space of what is usually a football pitch, crossing pot-holed streets while a fresh-faced boy with a pointed stick, wearing a tattered shirt and shorts, urges them onwards. Among many rural households in East and Horn of Africa, goats represent the rural community’s social safety net. They represent a marriage dowry, a measure of wealth and prestige. In Kenya, one goat can sell at market for $70. A juvenile, cherished for its soft meat, goes for $30. In countries where half the population live on less than $1.50 a day, the goat herd represents the family fortune, their bank account, their life savings. When goats go missing, when they die of thirst or starve from hunger, the resiliency of the entire community is compromised. Then, it is the people who are endangered. While we are talking goats, we can also talk about cows and camels. Cows can be sold for upwards of $500, and camels fetch upwards of $1,000 when sold to Saudi Arabia. 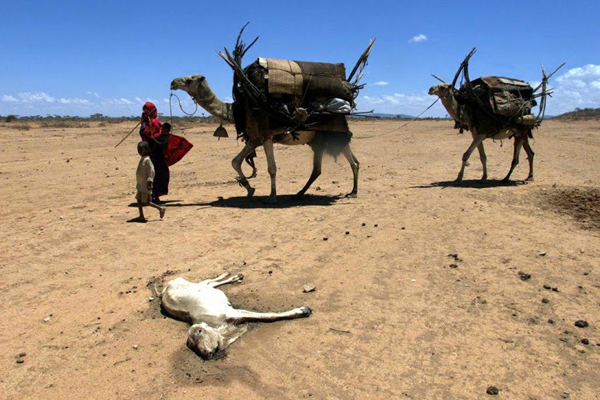 All in all, experts estimate that about 20% of the entire livestock of drought-affected areas has died. While these estimates are not precise, it is safe to say millions of animals died. It is not a stretch to think of more than 10-million livestock deaths. As aid workers, we talk about people, and we should. When the Horn of Africa last had a famine in 2011, we talked of numbers which are hard to articulate. Years on, it is still hard to imagine the scale of a drought which cost an estimated 250,000 people their lives. Over the past year, governments and aid agencies worked hard to avoid famine, and large-scale death was averted. We avoided a repeat of 2012. However, this is not a celebration. The International Organisation for Migration (IOM), a UN organisation, tracks the displacement of people. We know that when people leave their homes, they have lost their survival mechanisms. People don’t leave behind their goats and their land, unless they fear they will die. It’s that simple. Those displaced by environmental conditions surpassed 300,000 in Kenya, half a million in Ethiopia and a million in Somalia. And experts predict that the unpredictable and extreme weather events will only get worse. The Famine Early Warning System network offers evidence-based analysis to governments and relief agencies. While this past year has brought rains to most areas, changing weather patterns mean this is an impasse and we need to think of the future. At the same time, we still have millions in need of our help. We as humanitarians need to remind the world that we continue to need resources to help our people to survive. We also need to remind the world that we need to take care of our goats as we need livelihoods for sustainable return or people will have nothing to go back to. More importantly, we need to diversify livelihood strategies if indeed changing weather patterns continue to result in mass displacement and current population growth rates continue to prevail. In other words, we need to help the most vulnerable people to adapt. For the more than 1.5-million people displaced over the past year, they will continue to be stuck in dismal camps for years to come and are dependent on our generosity. • Labovitz is the regional director for East and the Horn of Africa for IOM, the UN migration agency.